Harry: Wow, it's hot out! Jen: I know! I had to move some furniture, and by the end, I was sweating buckets! Harry: Do you need help? Jen: No. We got everything moved. But the next time I decide to rearrange my living room, I'm waiting until the winter. Jen: Wow, it's hot out! Harry: Yeah it is! I went hiking yesterday, and I was sweating like a pig! Jen: Was it a nice hike? Harry: Not really. It was so hot, I didn't really enjoy myself. Meaning: In this case, Harry uses the idiom "sweat like a pig" to tell Jen that he was also sweating excessively. 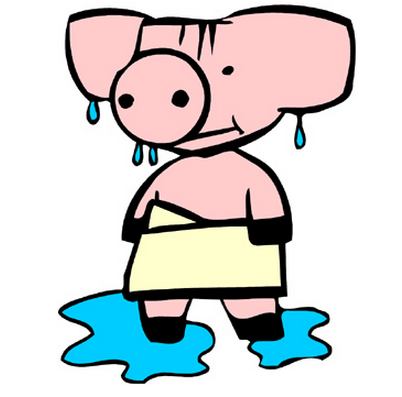 Ironically, pigs don't really sweat much, and they roll around in mud in order to stay cool, so this idiom doesn't make a lot of sense. This week, we are covering American idioms related to heat due to the high temperatures in Los Angeles this week.